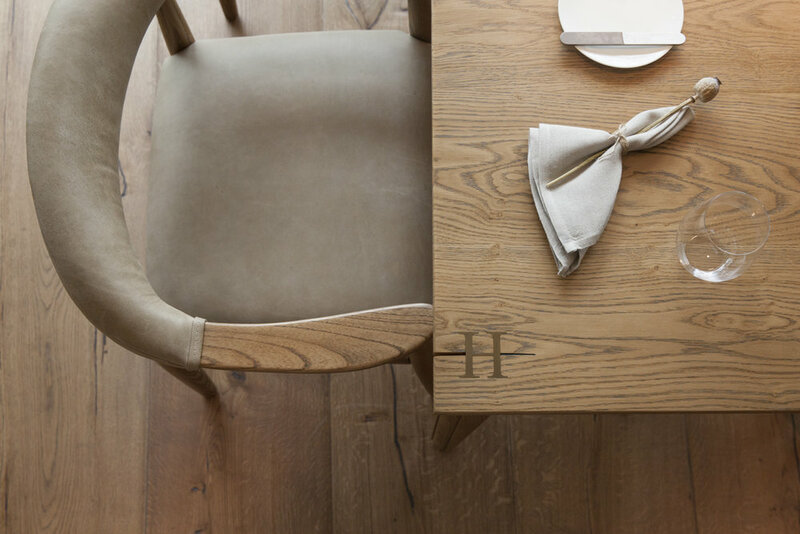 These White Walls was approached by Hedonism Wines to create a new concept and interior design for their flagship restaurant, HIDE in Mayfair - a joint venture with acclaimed chef, Ollie Dabbous. Hide—where the uncanny of the everyday is continually revealed. Our studio created an interior scheme based on the theme of ‘Dwelling’. The design concept takes traditional emblems of domesticity, and playfully reimagines them. The three floors—Above, Ground and Below—were each given their own distinct narrative. Taking ‘HIDE-as-Hidden’ as a curatorial cue, we commissioned three female artists to create site specific installations, each designed to challenge our perceptions of the ordinary. The restaurant Above, with its expansive glassiness, is a Hide without walls. A frosty glazing unwinds from the fairytale stair, enshrouding Ollie’s feature kitchen, where guests can catch a glimpse of the chefs at work. Light finishes and fine detailing give Above an air of delicacy and elegance. Bespoke tables and chairs, finished with tactile brass detailing, are set beside full height glazing. Here guests dine under the golden glow of eggshell pendants, amidst expansive views reaching across Green Park. Ground is a handsome yet homely space. It represents the familial warmth & wonderment of a fanciful hidden haven, where guests can escape the bustling streets of Piccadilly. Guests are welcomed at reception amid a warm patina of antique oak, bronze mirrors and aged brass. Beside a deconstructed 'Hearth'—the Bakery with wood-fired stove—our diners will find fine dining rocking chairs swaying at their tables. Nestled at the core of the spiral staircase, our rotating 'Rummager' cabinet quietly turns—its movement a manifestation of the wild spiralling momentum of the stair. We boldly stained the staircase's treads in gradient shades—each tread transforming from dark fumed oak Below, to the pale oiled oak of Above. This transition refers to the distillation process below, where activated oak slowly darkens clear liquor into amber fluid. In the same manner, the guest's experience is imbued with HIDE's heady alchemy whilst they dwell within its interior. A trap door is set into the stone floor at Hide’s nearby sister-establishment, Hedonism Wines. Standing over it, we wondered what might lie beneath this unassuming hatch...The basement bar, Below is our answer. A walk down the wayward stair takes our guests behind the amber-glowing back bar, to the unravelled Distillery. The bar’s looped footprint represents a rewinding of the distillation process, from bottle back to source. Guests can sip a house cocktail served up on a burr oak bar—its cracks and wells filled with pools of golden resin. Our studio works with artists to shape the identity of interior spaces. For HIDE, we commissioned three artists to reveal something extraordinary within the interior. 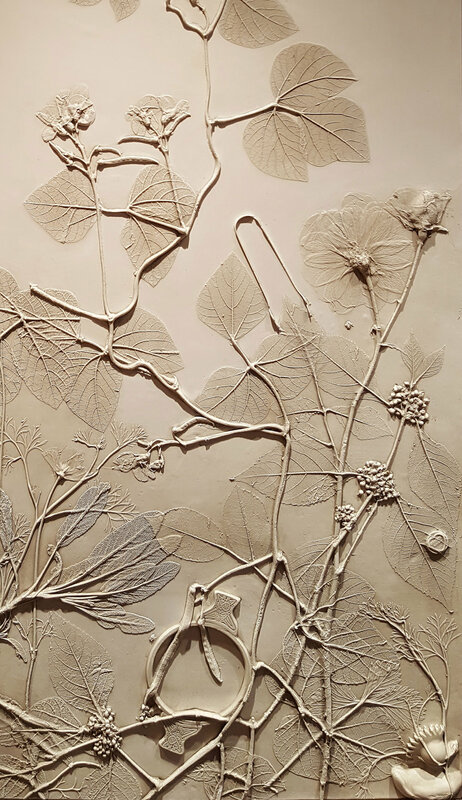 Rachel's hand-cast botanical panels perfectly capture the ephemeral. 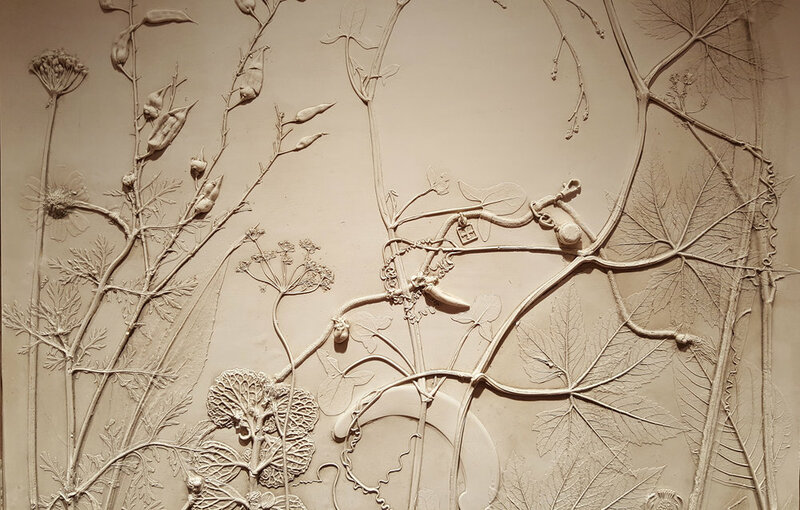 Her compositions of foraged flora delicately celebrate the fleeting beauty of London's wild flowers. We gathered treasured trinkets from the client's friends and family for Rachel to cast amidst the foliage. These momentos—subtly set in time and hidden in plain sight—form the backdrop to our disappearing dining room, known to guests as the HIDE & SEEK tables. Jeanette is an artist who explores the aesthetic potential of vegetation to form living art installations. Her sculptural murals captivate the viewer. 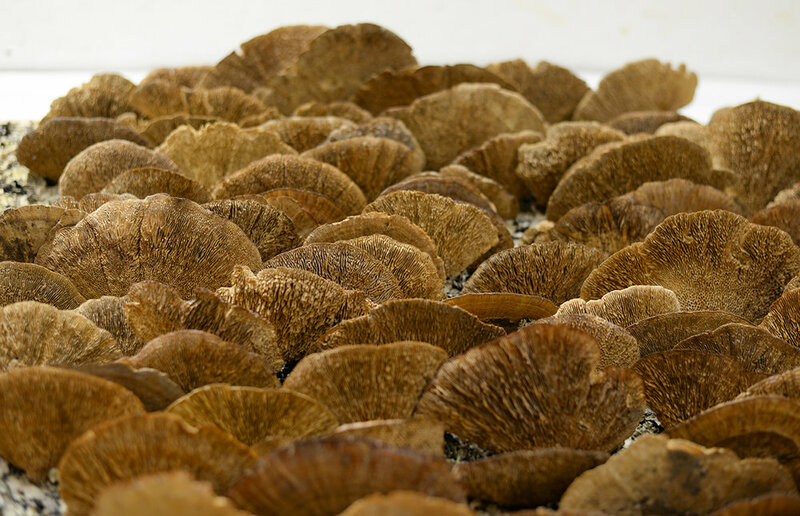 We wished to reveal something unexpected beyond the looking glass for our Ladies and Gents, so Jeanette covered the walls with compositions of funghi and lichen. We set them behind disappearing mirrors to create playful revelations—hidden encounters for the guests at Ground. Su is an artist working within the realm of paper; the pages of old storybooks are her medium. By cutting into and reconfiguring folkloric texts she reimagines fairytales in sculptural form. These White Walls commissioned Su to create an Arch of Escaping Stories where comestible characters might be seen to escape the culinary collection. The installation celebrates the potential of a well-loved library to excite the imagination.